Nine years after a fire destroyed Pratt Institute's Architecture School (because someone propped open the fire doors), it's nearing completion. 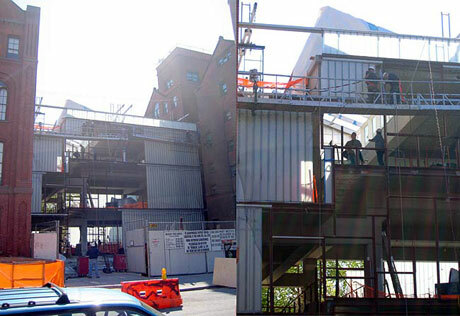 Higgins Hall, which houses the Architecture Department at Pratt, is becoming rejoined again by the Central Wing, designed by Steven Holl in 1997. The project is being executed with Rogers Marvel Architects (where I worked from 1997-2004) as the architect-of-record. I was at Pratt monday for architecture reviews. What astounded me was that none of the critics had toured it, even though it's been under construction for at least a year. The building appears small, crafted, and beautiful. They're rumored to be done in the fall, but no one was clear on "fall" as in "before the fall semester" (aka August) or "sometime before the end of November". Because there aren't a great deal of interior finishes (budget and the program both dictate this) it's entirely possible a late August move-in date is possible. Until then, you'll have to enjoy the renderings and progress photos.